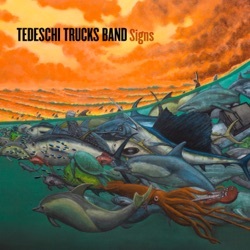 Signs is the fourth studio album by Tedeschi Trucks Band, released by Swamp Family Music through Fantasy Records from Concord Music Group on February 15, 2019. This studio outing emphasizes superb ensemble playing; the result is a beguiling album in which just about every note shines. They continue to sound like they care enough to dig deep and try harder. If the album occasionally falters with weaker tracks such as ‘Hard Case’, it makes up quickly with beautiful ones like ‘All The World’, a weary hymn that nonetheless comforts and reassures. The masterful musical soundscape could be painted only by collected talents of their twelve-piece ensemble. They now number 12, and Signs showcases an ensemble at their confident peak, whether on the gospel-charged funkery of Walk Through This Life or the torch ballad All The World. Some songs suffer from being underwritten and overplayed. Still, there are enough impressive moments to ensure that, at least on stage, they will detonate with the passion and soul the Tedeschi Trucks band generates at every show. A recording that will surprise and delight TTB fans as their most adventurous to date. What they do with this inspiration for passionate and impressive blues rock pieces and soul anthems deserves true respect. The Southern and Blues Rock collective is once again flying high. The intensity of Signs is something that really hits you. The Tedeschi Trucks Band’s Signs effectively corrects the downward curve of their studio work since 2011’s Revelator. At their best, the songs on Signs bristle with a kind of wide-eyed optimism. There's such warmth to the playing, you can picture the band members standing in the studio — playing together and off of each other, blending rock and blues and soul, accompanied by Trucks' impassioned guitar work and Tedeschi's soulful vocals. TTB!!! What soul! These songs are great! I can't wait for the full album. Can’t wait! TTB has never sounded better! The leaks on IG isn’t enough to help me get by...can’t wait to hear the entire album. Signs, High Times Just listened to that first cut. Got tears. This is a song for yesterday, today and with any luck for generations forever. I’m in the 4th quarter of life and this is the band that will take me rocking to my grave.